Playoffs for teams U11 and over – U9 participate in FunFest at end of season. Smaller groups with approximately a 12:1 child to coach ratio. These are training sessions designed for the younger players and run by professional trainers. No weekly practices. 10 week session - class meets for one hour on Sunday mornings. All players should wear shin guards and cleats. They will be given a jersey at the first session. Players will use size 3 balls. Soccer Stars do not have additional practices during the week. Have you noticed how smoothly our league of close to 700 children runs? Well, it takes a lot of work to keep Colonia's soccer league running. Fields, equipment, registration, etc. are things that need volunteers. All of these things happen because of the great job the CYSA Board has done. Many of our board members’ children are out of the league or entering the upper division. We urgently need volunteers from our younger divisions to learn the ropes and carry on after current members are gone. Please think about volunteering. 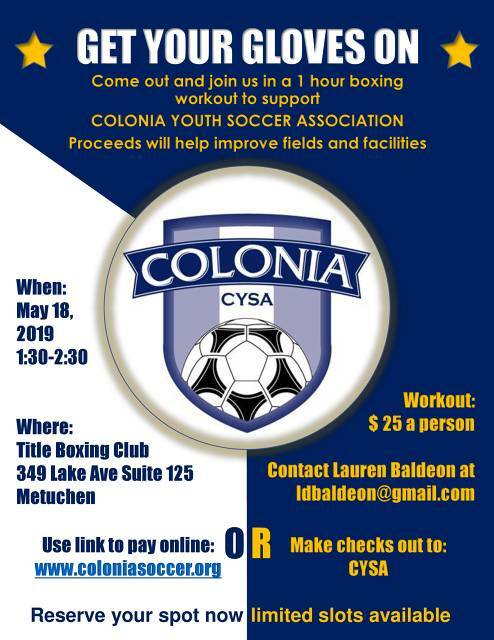 Join us for a Boxing Workout Fundraiser on Saturday, May 18 from 1:30-2:30!